There are two versions of Jorda / Zarda, one is pineapple and another one is orange. So in orange Jorda / orange Zarda orange zest, orange juice(optional) and pulp are used . And for pineapple jorda / pineapple Zarda diced pineapple and pineapple juice(optional) are used. I am giving here basic recipe , with that you can make your desire Jorda / Zarda / Sweet rice. Also need 100 grams kalojam(Small) / dry fruits / nuts for garnish . 1. Soak the rice in water about 15 minutes and cook the rice with bay leaf, cinnamon stick and food colour. Drain the rice and keep aside. 2. Heat the pan with clarified butter on medium high. Add sugar, clove, cardamom powder and 1/4 cup water. Cook it till sugar is melt. 3. Add cooked rice and orange / pineapple and cook till sugar and rice cooperates together. 4. Add mawa, sliced nuts and orange zest(If your are make oramge jorda) ; stir it. 5. 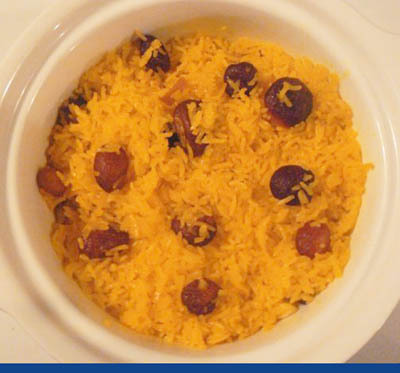 Turn off the heat and serve chilled Jorda / Zarda / Sweet rice garnish with kalojam / dry fruits / nuts. 1. Cook rice bit over, I mean that you need bit overcook rice, otherwise your Jorda will be too hard. 2.Instead of water you can use orange juice / pineapple juice to make syrup . damm I missed it…looks so yummy and u know I luv sweets…sure it was tasty…keep posting bhabi…and I will try it…means my wife will surely try it for me..lol..thanx again. Thanks Tabassum. Lemon is one of my favourite flavour. I will definitely try. I love when people share tips and tricks. I am sure that your hubby will love it because being creativity is the must quality of a good cook. So good.Thanks for the sharing recipes. Will u kindly tell me what is food colour pineapple or orange & how to make it… Can i get this ready made in shop??? Explain in elaborately ..